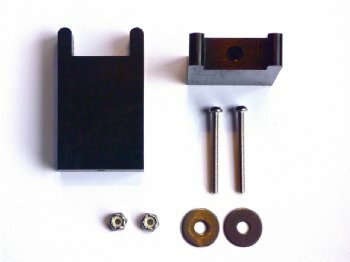 These mounting blocks are an excellent option for secure minimalist mounting. They can be used to: fill the space under the Main Body Tube, raise the rig over hatches and hardware, and allow movement of the rig fore and aft to better accommodate different size individuals. See this Blog Post, http://kayaksailor.com/outfitting-our-new-boat/. They are expertly machined from a single piece of black 1/2" Delrin® and are designed to be cut down to the exact height needed for your application. Please feel free to call, Skype or e-mail us.